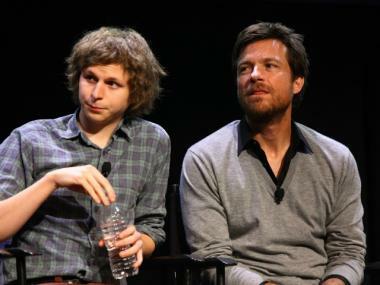 Michael Cera and Jason Bateman attend The 2011 New Yorker Festival: 'Arrested Development' Panel at Acura at SIR Stage 37 on October 2, 2011 in New York City. MIDTOWN — Choosing the wrong answer would be a "huge mistake." Fans of the cult hit TV show "Arrested Development" will have a chance to show off their knowledge of never-nudes and banana stands at a month-long trivia tournament at the Croton Reservoir Tavern. The epic trivia tournament, which will run at the bar at 108 W. 40th Street throughout the month of February will bring together dozens of teams to square off in a contest testing their knowledge of the Fox show's wacky facts, from the obvious to the obscure. Competition is set to be fierce — some teams have been training for months, and others are coming in from out of town. "Arrested Development," which originally ran on Fox between 2003 and 2006, and starred Jason Bateman, Will Arnett, Michael Cera, and Portia de Rossi, among others, was praised by critics, but did poorly in the ratings. The show chronicled the often-ridiculous Bluths — a wealthy family who lost everything, and starred Bateman as the straight-man son who had no choice but to keep them all together. The cast announced in October that the show would return in 2013, distributed exclusively on Netflix. The upcoming tournament runs on Mondays in February and early March, with the top six teams of each night fighting for Bluth-knowledge supremacy at a final countdown on March 10. Spots for the tournament are nearly filled up. Teams of one to six can sign up at the event's Facebook page. Dressing up in a costume — like Arnett's character GOB's flashy magician outfit or Cera's character George Michael's muscle suit — is encouraged. Bringing by some chocolate-covered frozen bananas couldn't hurt either.